Boeing Business Jets has delivered the first BBJ MAX airplane to a customer the company announced at the National Business Aviation Conference and Exhibition. The aircraft is scheduled to fly to an interior finishing centre. “We are excited to begin delivering a longer-range and more capable version of the world’s most popular business jetliner,” said Greg Laxton, head of Boeing Business Jets. Customers from around the world have placed orders for 20 BBJ MAX planes. Most recently, Seacons Trading announced in July it is purchasing a BBJ MAX 7 at the 2018 Farnborough International Airshow. 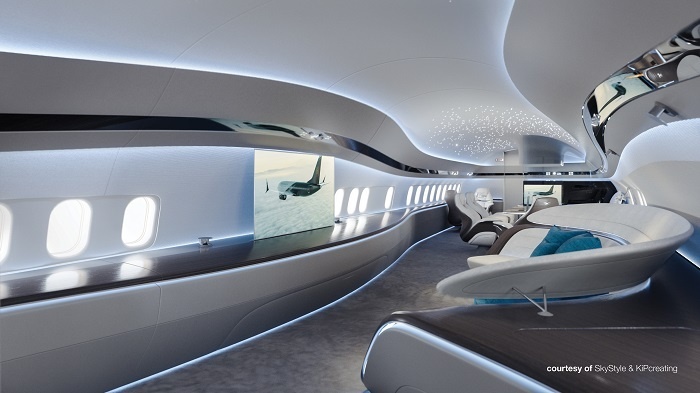 To commemorate the first delivery, Boeing Business Jets unveiled a new interior concept by award winning aviation design firm SkyStyle. The concept, named Genesis by SkyStyle co-founders Max Pardo and Lucas Colombo, represents the company’s debut in BBJ MAX design. The BBJ MAX family – based on Boeing’s best-selling 737 MAX plane – offers business jet customers the best combination of space, comfort and range. With more than three times the cabin area as most competing business jets, bespoke interiors to match any preference, and lower cabin altitude, the jet is capable of flying 7,000 nautical miles.